The modern world is filled with talented people who, for whatever reason or reasons, have never made it into the limelight. Lili Aňel is one of those people. Lili and I have been good friends since 1977. Therefore whatever I write may seem totally bias. However, I am one of the consistant few who have watched her amass all the credits on her resume. And believe me it's quite a list. Long before she ever recorded, her performances were favorably reviewed by Stephen Holden of the New York Times . In the 80's, after being nominated twice, she was the winner of a New York Music Award as Best Unsigned Artist. She has opened for and shared the stage with Richie Havens, Odetta, Roger McGuinn (The Byrds), Susan Vega, Pat Dinizo (Smithereens), Boz Scaggs, Joan Baez and her long admired friend Garland Jeffreys. The list of names is longer than I can recall but if you're reading this I'm sure you get the picture. 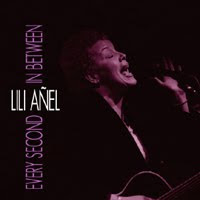 CD “ Every Second In Between.” The new CD is the best representation of Lili's music to date. While incorporating and paying homage to her influences like Nina Simone, Lili's singing is crisp, straight forward and melodic. I'm tempted to say that Lili's voice nowadays sounds like that of a seasoned performer's but a better statement would be that her voice sounds like a finely tuned instrument. Getting back to Tuesday night, I ditz-ed out thinking I would be arriving at The Living Room early. The problem was that I didn't pay attention; the invite for the show stated it was at 7:00 not 7:30. I walked in on Lili's beautiful old fashion ballade “Won't You Stay.” As usual Lili had the complete attention of the audience which is often hard to do in a place like The Living Room. The next song was “ So Far Away,” a song Lili wrote with her twin sister Barbara who is also an accomplished musician. Barbara was in the audience. AND it was true to form that Lili had to rib her. She started her ribbing by stating that her mother bought Barbara a piano first before she gave Lili money for a guitar. Then she ribbed Barbara by talking about how Barbara learned classical music and how she was a type “A” personality. I laughed, Barbara smiled. It's always been a funny thing between the two sisters done with much love. When I covered Tegan and Sara's Town Hall Concert, I mentioned the same sort of thing in depth about how sisters love to rib each other. I still find it funny. Lili's current band configuration is a small trio consisting of Lili on guitar along with percussionist Jim Armstrong and bassist Mike Kurman. Jim wonderfully compliments Lili's music by paying strong attention to her melodies and underlining their nuances with strong and subtle rhythms. Mike plays a mean bass – his playing is fluid but he can funk out with the best of them. He did both for his solo during the song “Thin Line.” (I could have really seen him funk out on Temporary Amnesia but remember I was late). John is another one of those musicians who I have seen in recent months performing on stage barefoot. The other two were Mika and Harley Prechtel Cortez of Red Cortez. The first time I noticed a performer do the barefoot thing was Boy George at Madison Square Garden in the 80's. So, for future articles, I am going to pen going barefoot as BGS, Boy George Syndrome. Although Lili didn't do all the music on her CD, she did my favorite “Supposed to Be.” I not only find the song intriguing but think it's a new vantage point to the age old subject of wanting someone else to be something they are not. It was obvious that everyone in the audience was moved by Lili's heartfelt performance. The song was correctly placed as worth holding till close to the end of her set. If reading about Lili Anel moves you to see one of her performances, I promise you will enjoy every note including the background voices her sister Barbara and I will be doing from the back of the room.